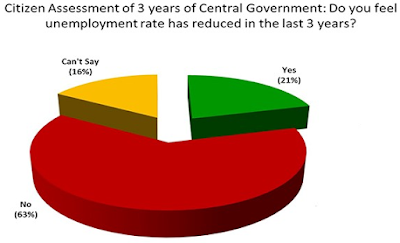 The Government of India’s quarterly employment surveys (QES), which began in 2008, suggest that the rate of job creating in India has contracted sharply by 64 per cent after 2014, the year Prime Minister Narendra Modi took over reins of power in the country. 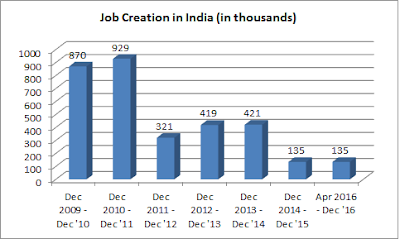 A fresh analysis of job creation in the non-farm sectors, based on QES data, shows that while the rate of rate of job creation in the two year period 2011-12 and 2012-13 was 7,40,000, it went down to just about 2,70,000 in the period 2014-15 and April-December 2016. 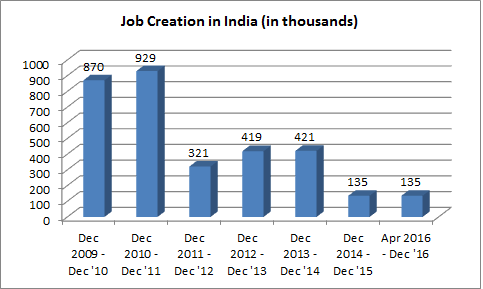 Significantly, the sharp fall in job creation, according to Roychowdhury, has come about despite the fact that the Government of India brought about a major change in 2015 in survey methodology. The new survey methodology does not cover just six selected manufacturing sectors and two services sectors only, which was the case till December 2015. Starting with April 2016, the data reflect the “whole of manufacturing sector along with two services sectors”, says Roychowdhury. “Thus, although there is a problem with strict comparability, the conclusion of falling job creation is strengthened”, she adds. Further pointing out that the Prime Minister’s dream of transforming India as the ‘skills capital of the world’ seems to have run out of steam, Roychowdhury quotes a recent government report, ‘Rationalization and optimization of the functioning of the sector skill councils’, to say how here also the government has faltered. The note continues, according to her, that “there is huge shortage of qualified trainers”, even as recommending reorientation of programmes to “concentrate on quality of training and focus on twin objectives, to meet industry skill needs and employment to youth”. “This remains a grave concern as other reports suggest that less than 12% of those trained under Skill India programme got jobs. It appears then that the promise of massive job creation was largely belied”, she adds. Rowchowdhury’s revelations acquires significance, as it comes close on the heels of a major survey by LocalCircles which says that 63% of urban youths said unemployment rate “has not reduced”, up from 43% last year – a whopping rise of 21 per cent who believe Modi has failed to deliver on the jobs front.